I started making student planners when my son entered Challenge A. Through the year I simply made a couple changes and made a “generic planner” that I could adapt for my daughter to use while in Foundations. This year I wanted to make something specific to Foundations and so I’ve created my first Foundations Cycle 1 Student Planner. This planner is for the student to use (a mom planner is also coming soon!). Why use a student planner at the Foundations level? I usually plan out my weeks and keep track of what resources and lessons I want to do each day/week. My kids, however, didn’t see that list. Often they would get frustrated as they thought that their school day would never end. Over the years I have done different things to help them. I’ve used workboxes, checklists, charts, etc. In the end, the thing they really need to know how to do is fill out a student planner (or agenda) for their week. They will spend all their years in Challenge (or whatever middle/high program they might be enrolled in) as well as just daily living, working from a calendar or agenda of things to do. 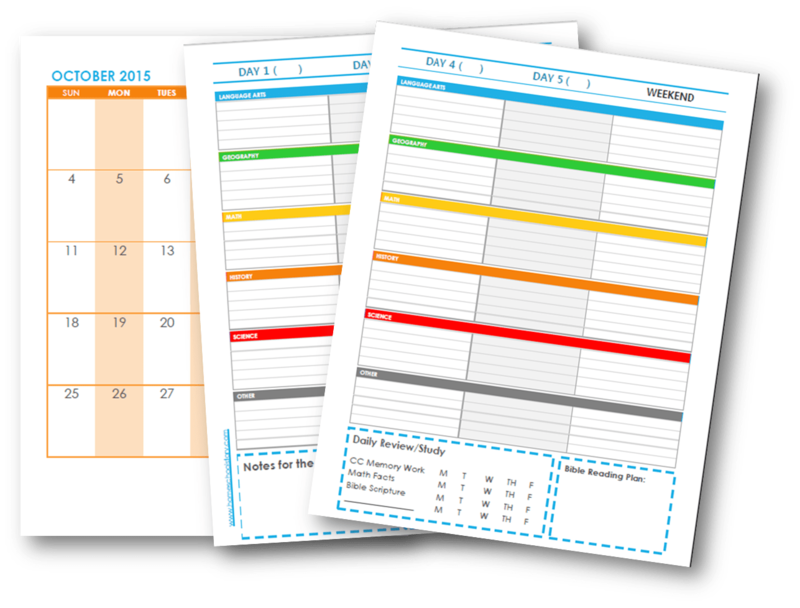 Most careers and companies have calendars, checklists, project boards, etc. So why not teach them while they are young so these skills will just become natural? How do you use planners with younger students? I still have my own personal “lesson planning” sheet that I work from. Depending on the age of the student, either my child or I will transfer the information from my book to theirs. This can be done several ways. For the youngest students you might leave their weekly pages blank. I know that sounds weird, but you can use the spaces as a sort-of checklist. As they finish a subject they can color the square, cross it out, put a sticker, etc. in each blank. This helps them see how much they have done for the day and how much is still left to get done. Older students can copy either from a white board or even from your lesson book. Being able to copy from a board is a skill to be learned. It seems easy for us, but it’s actually hard for kids until they are a bit older. You can use this as a time to practice that skill. If your child is having a hard time copying or handwriting itself is a chore, you can always copy the information into their books for them. There is nothing wrong with that at all! Why are there day numbers rather than days of the week? I originally had the option to either get a planner with days of the week or just numbered days (Day 1, Day 2 … through Day 5). In the end, more people order the “No Days” option so I stopped making the days of the week planner for our CC specific planners. Since all the CC communities meet on different days of the week people liked to arrange their weekly pages to either start their week (Day 1) as their community day, or end their week (Day 5) as their community day. It think it just hurt their brains less to NOT have the days of the week! Since I’m a Monday community, it didn’t bother me either way, but for those who might meet on a Thursday, this seemed to help. Weekly Pages: Day 1 – Day 5 + Weekend will span across 2 pages to give plenty of room to write. Subjects are labeled as Language Arts, Geography, History, Science, Math, and “Other.” The colors for each of the subjects matches the colors used by CC on their Memory Work Flash Cards. On the bottom of the weekly pages there are places for notes, things to do, Bible reading plan, and a daily checklist for review and memory work. Notes Pages: The notes page is simply a lined page that your child can use to write down notes, outlines, lists and more. Reading Log: If you’re like most homeschoolers, you encourage a lot of reading. Your students can use this log to keep track of how often and how long they are reading each day/week. 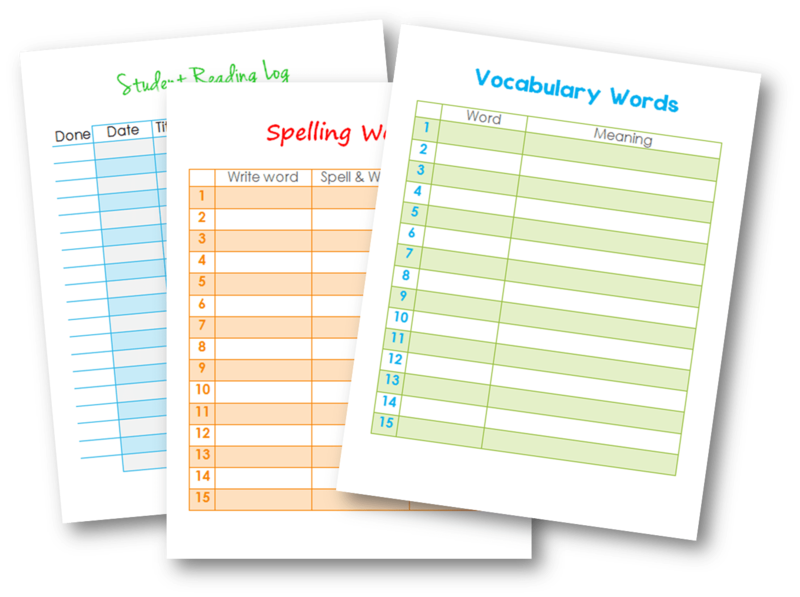 Spelling Word Lists: The spelling words page is a fill-in-the-blank type page for your child to use to practice spelling words. There are three columns for them to first write, then spell and write, then say and write… for each word. This is in color but looks great printed in black and white. Print as many times as you need. Vocabulary Word Lists: The vocabulary word page is also a fill-in-the-blank type page that can be used for whatever vocabulary you might be working on. If you have a child in Essentials, you could even use this page to write out the words and definitions of each lesson’s vocabulary words. Maps: Since we study Africa and the World during Cycle 1, I’ve included some royalty-free outline maps for your child to use. These can be put in page protectors or laminated so your child can trace or label with a marker. You could also print them out several times to color and label, or just print them once and use tracing paper to practice drawing. 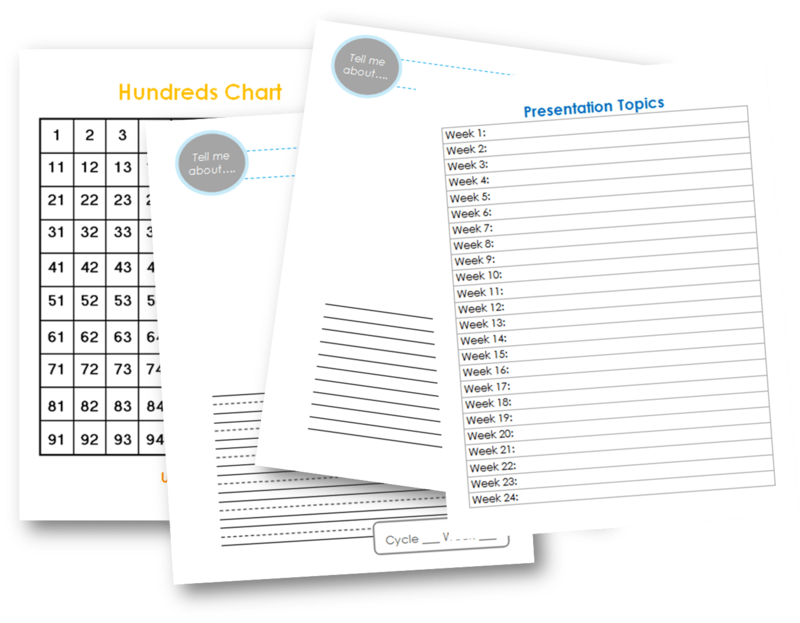 Hundreds Chart: The hundreds chart can be used in many ways. I usually use it to practice skip counting. Again you can place in a page protector or laminate so your child can use markers to color each number as they skip count. Presentation Topics List: Each week your child will give a presentation in front of their class. Use this sheet to organize and brainstorm ideas throughout the year! 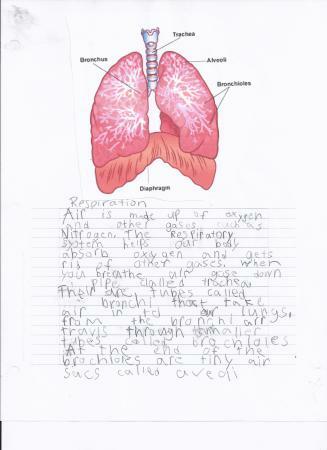 Notebooking Pages: These pages have a place at the top for your child to write in the History and the Science topic for the week. You would need to print 48 copies of this page (2 versions to choose from). 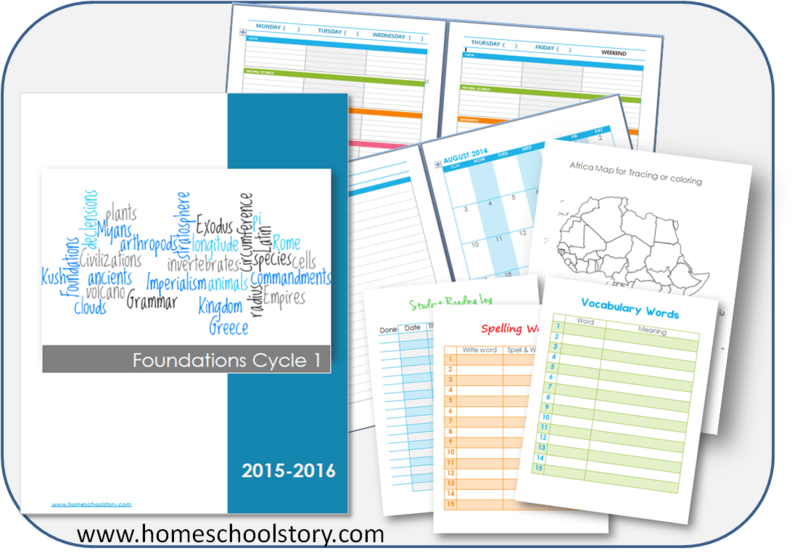 This will give you 2 notebooking pages per week – one for history and one for science. 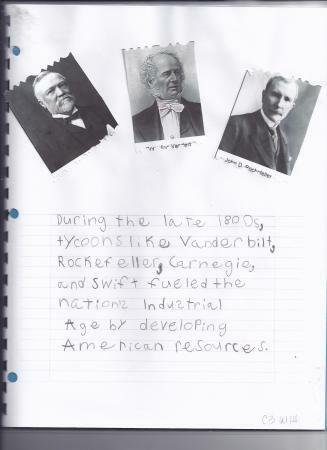 Personally we use these pages to write out a summary of what we learned about that week in history and science. For younger students you can use this as a place for them to copy their history and science sentences. The blank area at the top allows them to either hand draw an illustration or glue a picture from the internet. At the end of the year you’ll have a great keepsake of all their history and science studies! Here is what a notebooking page could like. Older students would write about what they learned while younger students use the space for copywork. Click on the image below, or simply click on “Shop Our Store” at the top of this website to check out all our planners and more! Don’t forget to supplement your planner with our amazing Memory Work System Cards! These cards will help you keep on track of all your memory work review throughout the year! Kids like to know what is expected of them and how much they need to get done each day. With this simple to use planner you’ll not only feel organize, your children will also learn and benefit from using their planners! 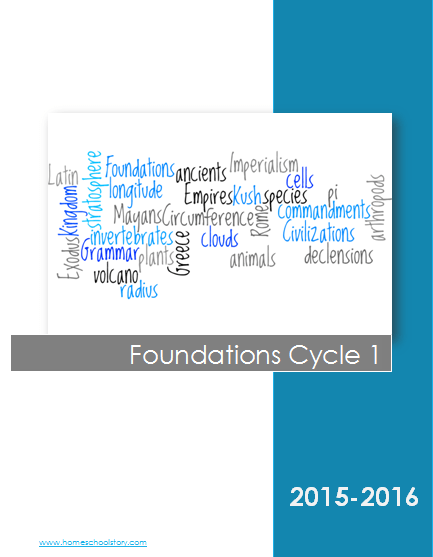 It’s full of great resources that will help you through your Foundations Cycle 1 year! I’d love to know what else you think should be included! Most of these ideas have come from CC moms like yourself! This looks amazing! I have been trying to figure out how to do a student planner for my young daughter. This is great!! The only thing that I think I would add is check boxes on the weekly schedule for each subject and each day. That way the student and parent can track easily what they accomplished and where they are at in their work. I love the added pages. What kind of binding would you recommend to use for this student planner? Hi Dawn, thank you for your ideas! I’ve had a few people ask for the check boxes! Binding: spiral binding would probably be the best, but comb binding would be okay. You can certainly just hole punch it and place it in your child’s binder. That’s what I’ve done. OK, I just stumbled across this, and THIS IS AWESOMENESS!! I love this planner! For those of us who homeschool year round, could calendar pages be added for June and July also? Thank you. Would love to have the other months added in as well! I know have additional months included! Hi Kim, yes! I am adding the extra months now. It will be in my store as a free download so it can be added to any of my planners! I agree. Even though this planner’s main purpose is to help organize during the CC schedule, we enjoy learning extra stuff during May-August when we have more free time. Adding these months would help us keep track and turn it into a yearly journal for their work. If you could add these months for me, I’d love to purchase 4 of these. Thanks for all the time spent on creating such beautiful planners!! love it! Do you have a challenge a? is this “editable” by us? I do my lesson plans on the computer, but would love to do them on this format. Excited to order this!! Is there a spot on the daily pages to add other responsibilities…piano practice, additional history lesson, etc. What sort of things would you put on the weekly pages. For instance, I assign my kids a math lesson, an Explode the Code lesson (phonics) and then have them do Math drills and CC Review both on their ipad. So, I’m not sure what I would have them write for each subject on the pages.